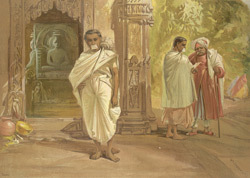 This chromolithograph is taken from plate 27 of William Simpson's 'India: Ancient and Modern'. Jainism is of one of the oldest religions in India. Jains are followers of Mahavira (599-527BC), who was a contemporary of the Buddha. A central tenet of the religion is 'Ahimsa' or non-violence and Jains have extreme respect for all life. Jain priests cover their mouths with a cloth to avoid inhaling and therefore killing insects.